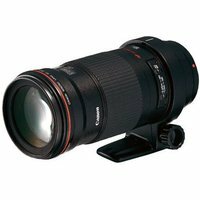 The Canon EF 180 f3.5 is a telephoto macro lens with a maximum magnification of 1x. Macro life-size close-ups can be taken from a farr distance without disturbing subject (birds, insects etc). Canon internal floating system minimises fluctuations in aberrations caused by changes in focusing distance ensuring razor-sharp delineation from 1x to infinity.